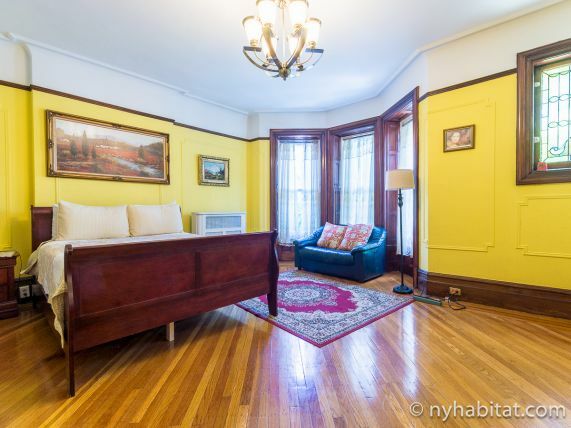 This five bedroom triplex apartment is located in the Prospect Lefferts Gardens neighborhood of Brooklyn, New York. 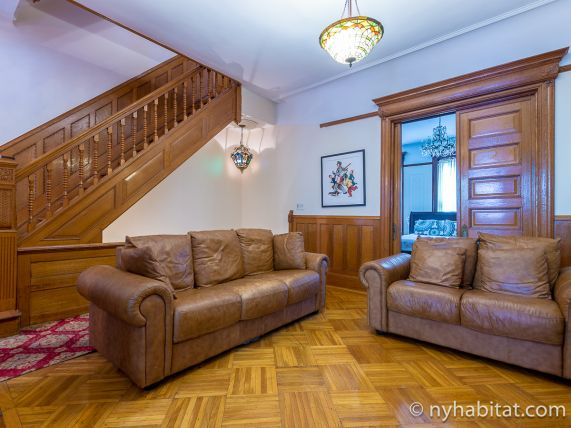 It is on the top three floors of a four-story (equivalent to the European 3-story), walk-up brownstone that dates back to 1901. There is a buzzer-video intercom security system at the entrance. During your stay, you’ll have access to wifi internet throughout and optimum digital cable (with recording capabilities) in all bedrooms. This fully furnished apartment can be rented room by room, as a bed & breakfast, or as a monthly roommate share accommodation. Alternatively, the top two floors and common rooms on the parlour level can be rented as a private apartment to a single group, either for a short vacation or a longer sublet. 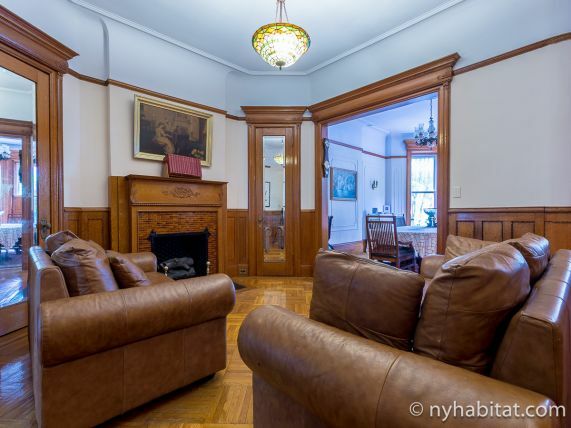 The traditional brownstone building retains many of its original features, with hardwood floors throughout, stain-glass window accents and classic moldings in the walls and ceilings. Several windows with either northern or southern exposure allow in the natural light and offer views of the Front Street and backyard. Entrance is onto the parlor level, you’ll find the living room, which features a lovely operational fireplace, perfect for cold nights, and is furnished with two sofas, and opens into the dining area with a table for six. 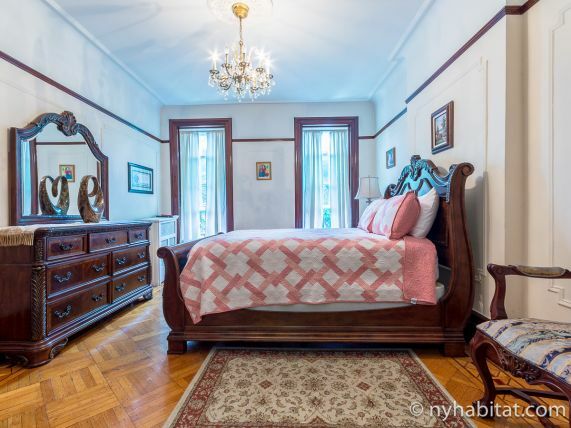 There is one bedroom on this floor, Bedroom 5, which has a queen size bed, a lovely decorative fireplace and chandelier lighting. Sliding doors can lock from the inside and connect to the living room. On the Second floor, there are two bedrooms. 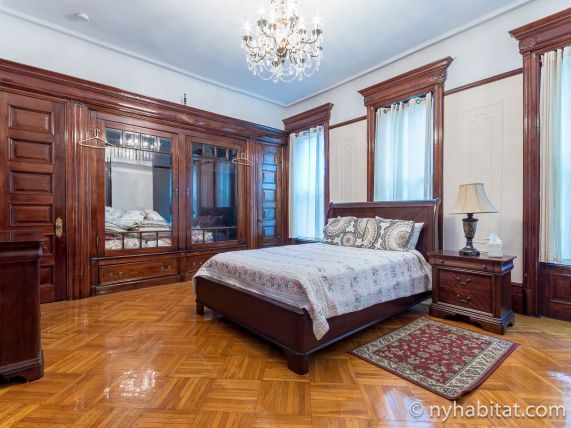 Bedroom 1 has a queen-size bed, nightstand, and vanity dresser. It opens onto a living area with a sofa, side table, closet, and flat-screen TV. Bedroom 2 also has a closet, flat-screen TV, and a vanity dresser. 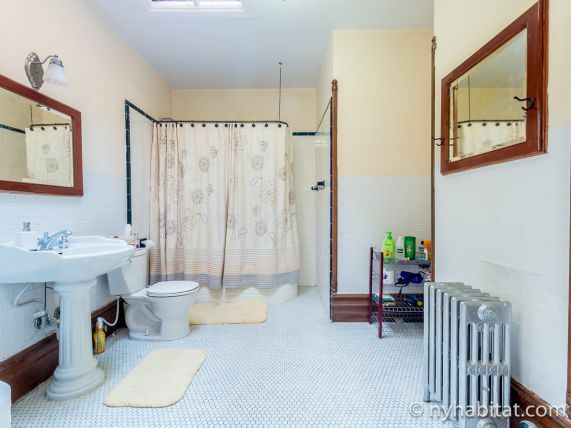 The Bathroom is equipped with a shower, a toilet and a sink. 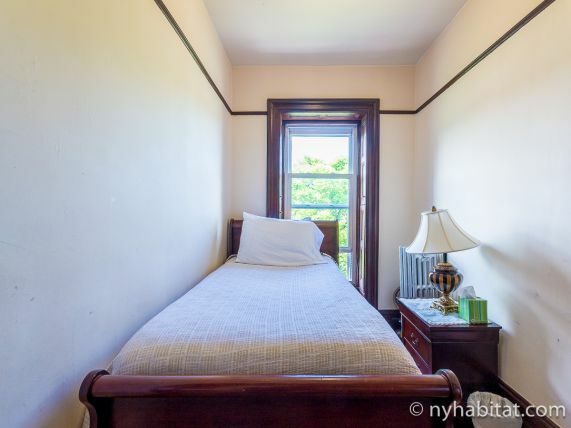 On the third Floor, you will find the kitchen, Bedroom 3 which has a queen sized bed, a dresser and a closet, as well as Bedroom 4 which has a queen sized bed, a closet and a view of the backyard. 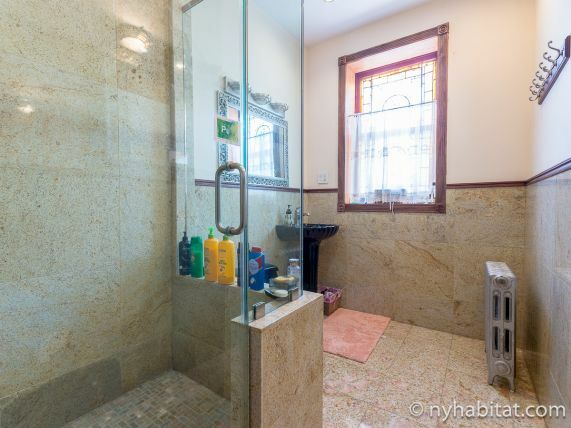 The bathroom features a bathtub and a shower. 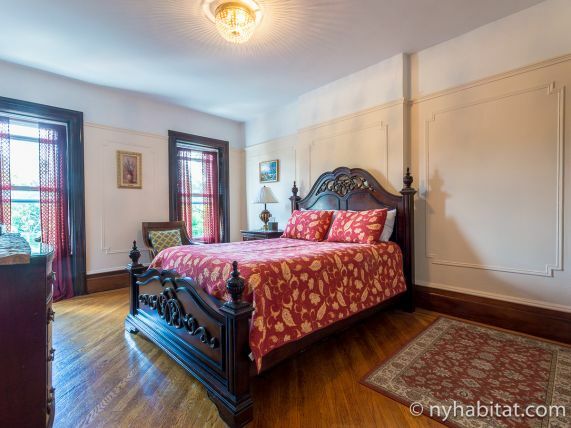 There is also a twin sized bed in the living room 2. 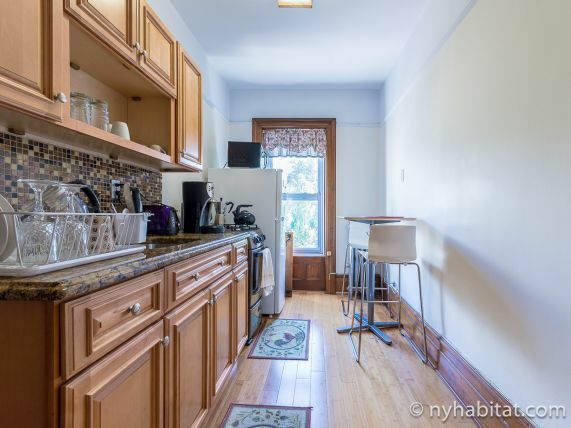 The rental is just two blocks from Prospect Park, which is home to the Brooklyn Public Library, Eastern Parkway Museum, and Concert Grove. This public green space has many attractions, which is why it is a favorite spot among locals and tourists. You can enjoy a lakeside picnic and then visit the botanical garden, and its beautiful cherry esplanade! Furthermore, you can play outdoor sports in the numerous fields or take a stroll along the trails and meadows. Grab a bite just down the street from the apartment, at King of Tandoor, which serves delicious Indian food. If you prefer Mexican cuisine, head to Café Enduro (4 blocks north) on Lincoln Road, which offers great brunches and mouth-watering banana fritters for dessert! Every Sunday from April to October you can also enjoy different foods from Smorgasburg in Prospect Park! It is a great way to enjoy foods inspired by many countries while walking around the park. 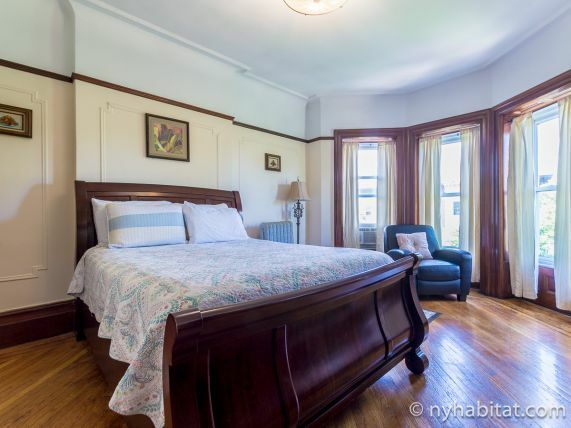 Situated on Rutland Road and Flatbush Avenue, this five bedroom apartment is within close proximity of three subway stations, making it easy to get to other areas of NYC. You can take the Q train either at Parkside Avenue / Ocean Avenue (7 blocks) or Prospect Park / Empire Boulevard / Flatbush Avenue (5 blocks). The latter also offers service on the B and S lines. The Winthrop Street / Nostrand Avenue station provides access to the 2 and 5 trains.